LeptiSense is a weight loss supplement brought to market by the Florida-based company Jaylab Pro and the official sales page is ridiculously long-winded and seems to go on forever. The product is aimed at people who need to lose 10 pounds or more and is not deemed suitable for anyone who has less weight to lose. That’s rather unusual, but LeptiSense is not your everyday weight loss product. Jaylab Pro state the reason a lot of people struggle to lose weight is because they are suffering from hormone imbalances that increase the desire for food while simultaneously slowing down the metabolism. LeptiSense is their nutritional fix and the company claims it’s so good it can even support weight loss without the need for exercise. Positives: We are trying to draw some positives. Negatives: Not the greatest formula. There are better products on the market in our opinion. What Is LeptiSense and How Does It Work? According to the marketing material, the formulation has the ability to regulate leptin levels. This is the hormone responsible for controlling energy expenditure, so leptin levels can affect the metabolic rate and, by optimizing leptin, LeptiSense is alleged to provide a faster metabolism that burns more calories and fat while also preventing the hunger urges that can make it so hard to lose weight. The theory behind this is very involved it’s as difficult to prove as it is to disprove, so let’s take a look at the list of ingredients instead. That may provide a better idea of what the formulation is really likely to do. Sensoril (125mg): A branded Ashwagandha plant extract. Some evidence shows Ashwagandha may lower cortisol (stress hormone) levels. Chromium Polynicotinate (300mg): A chromium-providing ingredient and the dose provided here is high enough to be concerning. A lot of diet pills contain chromium because it controls blood glucose and can prevent carb urges. However, the dose provided is seldom more than 100mcg per day and experts generally recommend consuming no more than 50 to 200mcg per day because higher doses can interfere with thinking ability, irritate the skin, and cause other side effects. Knowing this, we thought there may be a printing error on the label so we range Jaylab Pro support and asked if it was really 300mcg. We were told it was 300mg and when we asked if it was possible to double-check the figure because such a high dose may be dangerous, the customer services operative suddenly complained there was a bad connection and terminated the call. Beta-Carotene (5000 IU): Provides Vitamin A. Although Vitamin A is unlikely to help with weight loss, it has antioxidant capabilities and can be good for improving the health of major organs including the brain, heart, kidneys, and lungs. Gum Arabic: A gum extracted from certain kinds of acacia. One study suggests the ingredient may support weight loss, but further investigation is needed. Guar Gum: A natural fiber that may limit the amount of cholesterol and glucose that passes through the walls of the intestines and is picked up by the blood. Guar gum also expands in the intestines. This may help reduce the appetite but, again, more study is needed. Locust Bean Gum: Also known as carob gum, locust bean gum is often used as a thickener or gelling agent in food. Pomegranate Extract: A nutritious fruit extract that provides a number of desirable health benefits. Beta-Carotene: We are unsure why a second dose of beta-carotene is needed, but here it is anyway. Usage Instructions – One capsule is required two times per day and should be taken with 8-10oz of water just before a meal. Using the product alongside a sensible diet and exercise program will help to improve the results. The only reviews we could find are the ones published on the manufacturer’s website and reviews published via such a biased source cannot be relied upon to paint an accurate picture of how products are likely to perform for the average user. The label on the bottle warns the product is not intended for people who are under the age of 18. It also states customers will need to consult their doctor if they are planning on using LeptiSense alongside prescription or over-the-counter medication. However, the formulation contains an incredibly high dose of chromium so we suggest nobody use this product without speaking to a doctor about it first. LeptiSense appears to be exclusive to the manufacturer’s website and, although bulk-buy incentives are available, Jaylab Pro offers the best deals to people who opt for “VIP Membership” by agreeing to receive an ongoing supply of pills each month via autoship. This kind of arrangement can sometimes be hard to stop and is generally best avoided. Jaylab Pro is offering customers a 60-day money back guarantee. When we look at the formulation of ingredients used in LeptiSense we don’t really see anything that wows us or suggests even a marginally good weight loss product. A few of the ingredients, like guar gum, may offer some degree of help with weight loss, but the formulation looks pretty poor when it’s compared to the ones used in any of the top-rated diet pills. The fact that there is a money back guarantee means customers have nothing to lose by buying and trying LeptiSense, but the high level of chromium provided by the pills is very concerning and it’s our opinion that people who need to lose weight would be best staying away from this product and choosing something else instead. 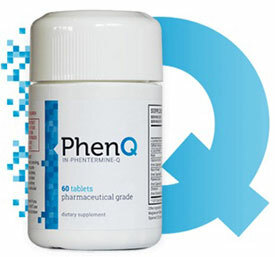 PhenQ is a multi benefit, multi action diet pill that is made from pharmacy grade ingredients. A powerful fat burner that can also block new fat from the food that you eat and also reduce your daily calorie intake. PhenQ has a long 60 day money guarantee and is shipped for FREE anywhere in the world.